Networks(DMN) are comprised of four modules. obtain a logic as hallway <-> football. Let’s see why a machine needs four modules to achieve this task while our brain did so effortlessly. is used. This choice is made after exploring LSTM and tanh RNN because of lesser computational cost and lesser suffering from vanishing gradient problem respectively. The sentences are first concatenated into a long list of word tokens inserting an EOS token. where L is an embedding matrix and wt is the word index of tth word of the input sequence. where L is an embedding matrix and wₜ is the word index of tᵗʰ word of the input sequence. The hidden states at each end-of-sentence tokens are the final representations of this module. The output of the input module is a sequence of T𝒸 fact representations c where cₜ denotes the tᵗʰ element in the output sequence. In our case, T𝒸 = 8 since we have 8 sentences in our input text. Question module: Since the question is also a natural language input, it is encoded similar to what is done in the input module. Episodic memory module: This module is the heart of this paper. It consists of an attention mechanism and an RNN to update its memory in multiple passes. During each iteration of the RNN, the attention mechanism attends over the fact representations by taking into consideration the question representation q and the previous memory mᵢ₋₁ to produce an episode eᵢ which is then used to update memory. The memory m₀ is initialized to question module output q. For certain tasks, it is beneficial to take multiple passes over the input to allow transitive inference. 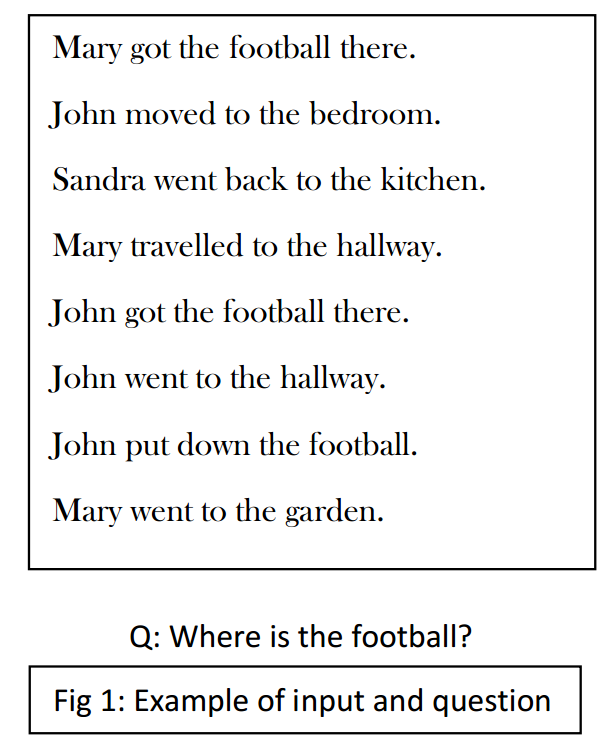 In our example, in the first pass, in the context of the question asked Where is the football? , the model attends sentence 7 — John put down the football because of the word football but in order to answer where, it needs additional information and hence requires another pass. In the second iteration, attention is performed with the respect to the word where in the question along with the previous memory that tells us that John and football are related. After multiple such passes, the final memory m(Tᴹ) is passed to the answer module. Another GRU is employed whose hidden state at is initialised to m(Tᴹ) and yₜ is computed in the following way. The last generated word and the question vector are concatenated and sent as input at each time step. The output so obtained is trained with a cross-entropy loss. PS: The results can be referred from the original paper. Ankit Kumar, Peter Ondruska, Mohit Iyyer, James Bradbury, Ishaan Gulrajani, Victor Zhong, Romain Paulus, Richard Socher. 2016 “Ask Me Anything: Dynamic Memory Networks for Natural Language Processing”.CoRR.